November 22, 2018 /31 Comments/in Singing /by Megan L.
Looking for good songs to sing at a talent show? Talent shows are a great opportunity not just to show off your vocal abilities, but also to express yourself. Check out the list below for some of the best talent show songs that span across genres and skill levels! This song is great for showing off a strong middle range without going too low or high. It’s a popular enough hit that commercial karaoke tracks should be easy to find, and piano sheet music is available if you have an accompanist. This song has a spunky, pulsing dance beat, along with a motivating message, making it perfect for young audiences. For more good talent show songs for mid-range female vocals, check out artists like Taylor Swift and Adele. You might know it from the Counting Crows cover, but the song “Big Yellow Taxi” and its heartfelt environmental statement go back a long way! This song can work for any vocalist, and can be sung in a fairly narrow range, making it pretty easy to perform. And if you play guitar, this song is great for playing and singing at the same time! Reach back in time to some retro music by listening to Joni, along with other artists from the Woodstock era, and you’ll find plenty of ways to make this message heard in your talent show. Folk rock songs are generally pretty well-liked by audiences. They’re a good choice for male and female singers alike, and most are relatively easy to play. “Take Me Home, Country Roads” is another good one for playing guitar and singing at the same time. It’s versatile enough to perform with friends, or even add harmony with multiple singers. You might also like some of Cat Stevens songs, or Simon & Garfunkel (check out “The Sound of Silence,” or their rendition of “Scarborough Fair” for more ideas). This is also a good example of a rock song that would translate well to an acoustic arrangement. For another softer Green Day song, consider “Time of Your Life.” Other punk artists who have good songs to sing at a talent show include Bad Religion, Flogging Molly, and Social Distortion. Are you looking to spice up your act with some movement and acting? Look no further than musical theater! “Make ’em Laugh” is the song from an iconic scene in the Gene Kelly’s film Singin’ in the Rain, featuring some of the best-executed physical comedy ever to hit the screen. Plus, it’s perfect to incorporate your own unique style! Fans of modern theater will also know songs like “Defying Gravity” from WICKED and “Seasons of Love” from RENT – or, look up stars from the Golden Age of Hollywood, like Shirley Temple and Judy Garland. Fast talkers will perhaps like the Modern Major General’s song from Pirates of Penzance. Your choices in the realm of musical theater are practically endless! Dennis DeYoung’s lyric tenor range makes Styx’s music particularly good for female vocalists with a strong alto edge, and “Come Sail Away” can be performed to show off your vocal range, as it encourages great flexibility. Songs like this are especially good for singing with a group of friends! Other hits in this niche include Heart’s “Barracuda,” “Roam” by the B-52s, or “Carry On Wayward Son” by Kansas. For more great talent show songs that are perfect for husky vocals (and impressing everyone with your taste) look into anything by Aerosmith or AC/DC. Speaking of how everyone loves rock and roll, this well-loved classic is sure to get audiences moving, clapping, and singing along! It’s an ideal song for involving a guitar and a drum set as backup, or you can probably find accompaniment tracks for this as well. If you play piano, rock and roll is a great genre to find songs that sound just as groovy as they do classy when translated to your instrument. When you’re learning to sing, performance experiences like talent shows are a crucial part of your development, and choosing your repertoire wisely is crucial. If you enjoy singing, consider taking voice lessons for the next step toward improving your craft! A voice teacher can help you select songs that are appropriate for your skill level, range, and style, as well as help you achieve your overall music goals. Above all, be yourself, and enjoy what you do on stage – that’s what your audience will respond to the most! Good luck on your journey to choosing the perfect talent show song. What other good talent show songs did we miss? Leave a comment with your favorites below! Want even more song ideas? Check out our list 400+ songs to sing here! May 17, 2016 /6 Comments/in Singing, TakeLessons Teachers /by Molly R.
There are so many opportunities for kids that love musical theater these days! The popularity of the “junior” editions of big Broadway shows is steadily increasing, for one. There are also several companies across the country that specialize in showcasing kids and only kids, as well as tons of musical theater summer camps. Needless to say, it’s super exciting to be a young performer. However, one thing that remains tricky is finding suitable repertoire that is both age-appropriate as well as fun. Don’t worry – we’ve got you covered! Many of these songs that I recommend are NOT from Broadway shows, but are definitely casting director-approved. Generally, there is more flexibility with kids’ repertoire as there aren’t as many roles for them. That means Disney movies, old standards, and novelty songs are some other styles will sometimes work just fine, unless the production team says otherwise. Most of all, casting directors are looking for performers who can prepare good material and perform confidently, and often won’t be as specific in their audition requirements with kids as they are with adult actors. While some of the songs in this list are meant to be sung by a specific gender, there are also several songs that work beautifully for either! So let’s dive in – here are 30 great musical theater audition songs for girls, audition songs for boys, and audition songs for kids in general. 3. “Who Will Buy?” — Oliver! 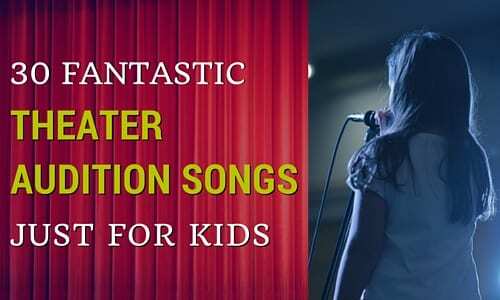 Some of these songs are more complex than others, so it’s crucial that kids work closely with a voice teacher to prepare their chosen audition pieces. In addition to musical accuracy, your young actor will impress their panel if they really know what they are singing about— so it’s a good idea that they do their homework as far as researching the character and show, too! Confidence is key, and a voice teacher can certainly help with that. TakeLessons does a wonderful job of matching kids up with the perfect teacher. Check out their online or in-person singing lessons so your child will be prepared to hit center stage. Have fun exploring these fantastic audition songs for kids, and break a leg! Molly R. teaches online and in-person singing lessons in Hayward, CA. Her specialties include teaching beginner vocalists, shy singers, children, teens, lapsed singers, and older beginners. She joined TakeLessons in November 2013. Learn more about Molly here! May 2, 2016 /1 Comment/in Singing, TakeLessons Teachers, Teacher Drafts /by Molly R.
As a wedding singer, choosing a song that represents the couple and their love story can feel like a lot of pressure! You might already know how fun (and let’s face it: lucrative) it can be to offer wedding gigs. Sometimes, the happy couple knows exactly what they want as far as the song goes. But often, they are certainly open to suggestions from the professional! As you’re working with the bride and groom, here are some ideas for choosing the perfect songs to sing. If the bridge and groom are young and hip, a Josh Groban song might not fly! Likewise, if it’s an older couple, they may want an old standard. If you know the couple personally, you might already know what kind of music they like. Browse through my recommendations below and offer them a couple of ideas to go from. Another important thing to consider is whether the event is super formal, or more casual. A beautiful classical song is ideal for a formal wedding in a church, but you may want a more current love song for a backyard wedding with a more laidback vibe. The final thing to consider is… YOU! When selecting any song, you have to think about your voice type, vocal ability, and styles that you sing comfortably in. A Handel aria would be out of some pop singers’ ability, and likewise, an opera singer may sound completely awkward singing the Beatles. You can also check in with a voice teacher for more advice on which songs to sing. Brainstorm together, keeping your vocal strengths in mind, to really come up with something that’ll impress the bridge and groom! Your teacher can also help you prepare for the big event so you feel confident. Most of all, have fun with it! Weddings are beautiful, and it’s such a great feeling knowing you’re contributing to the experience of both the bridal party and the guests. Enjoy it! April 29, 2016 /7 Comments/in Singing, TakeLessons Teachers /by Molly R.
As a teen, it’s important to choose an audition song that not only shows off your voice, but is also age-appropriate. Here, voice teacher Molly R. shares a few tips for selecting your song, plus 50 top picks for musical theater audition songs for teen girls and boys. It’s wonderful to be a teen musical theater performer! There are so many great opportunities at this age – high school productions, community theater, and even professional theater for a lucky few. 1) What is the production staff looking for? If they say “don’t sing from the show,” then don’t! However, you DO want to find something as close as possible to the show in question. For example, is the company doing an edgier show like “Rent”? If so, you may want to sing an audition song from a show like “Spring Awakening” or even “Hair”. If they’re doing an older classic like “Carousel”, consider something else by Rodgers and Hammerstein, like “South Pacific”, or something from the same era, like “My Fair Lady”. 2) What audition song suits YOU? What is your type? Are you more of the leading man? The sweet ingenue? Maybe you’re a sassy belter, or a character actor. The good news is that there is a huge variety of songs that are appropriate (and fun) for teen musical theater performers. This list includes songs for all types of voices and personalities, with several different styles and time periods. 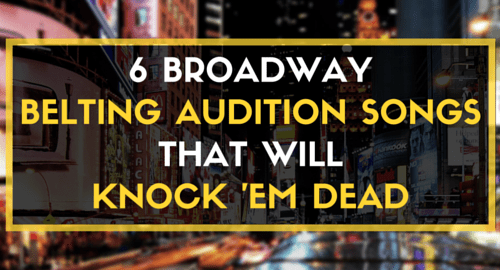 While many of these songs and tried-and-true classics, many are lesser-known and will delight your audition panel. 20. “Out of My Dreams” — Oklahoma! 21. “Oh, What a Beautiful Mornin’” — Oklahoma! I recommend being prepared with a few solid songs, as you never know if they’ll ask for more! Your repertoire book should have a variety of audition songs that include old and new shows, a song from a pop/rock musical, and at least one Disney song that suits you. And of course, make sure that you’ve had adequate time to practice and prepare before the audition. If you’re confused about what to select or how to sing it, consult a voice teacher near you, or find one online. A professional vocal coach will ensure that your voice is prepped and ready for your next audition. Have fun exploring the world of musical theater, and break a leg! April 14, 2016 /1 Comment/in Sheet Music, Singing, TakeLessons Teachers /by Suzy S.
I recently purchased a tablet. I didn’t buy this tablet for scrolling through Instagram or catching up on TV shows, though. I purchased it to replace my bloated, disorganized music folder. That’s right – I now almost exclusively use digital sheet music. At rehearsals these days I’m holding my tablet, not a binder. And I am so glad I made the switch! If you already have a tablet (or are thinking about purchasing one), you could switch over to digital sheet music too. Digital sheet music for singers — that you download onto your iPad or other tablet device — alleviates many of the issues involved with using physical copies and can make for a happier, more organized musician (like me)! Here are the pros and cons of making the switch – and what you will need if you decide to do it. I finally snapped because of a paper mess that’s been brewing in my studio for years. I have reams of old photocopies, opera scores, song books, and oratorio scores lining my shelves. The books are nice, but if you only need to sing one piece it’s annoying to lug a whole book around. The binders of photocopies have become progressively more unwieldy in the last decade. They are now so big that I dread having to take them out. On top of all that, as a full-time professional singer, I go through an insane amount of music. My everyday binder, which contained all of the music I was working on, exploded all over my bag at least once a day. My house was buried in stacks of photocopies and scores. The situation was bad for the environment, bad for my back, and bad for my sanity. Finally, after losing an important tax document in a gigantic pile of sheet music, I realized that something had to change. Now, all of my music fits into my slim tablet. I have way more music with me than I could possibly carry around in hard-copy format, and it’s neatly organized and easily accessible. Back to the tax document. When you’re handling large volumes of sheet music, it takes a lot of patience and time to organize it. If you fall behind in your organization, you start to lose music — sometimes music that you desperately need! With a tablet, that possibility is mitigated (much to my relief). In the old days, I felt a twinge of guilt every time I had to print a new piece of music. Now I have all of the music I need without using a single sheet of paper. This is particularly helpful if you are part of a singing group, like I am. When I switched over to digital sheet music, four of my five co-workers did the same thing. We are killing far fewer trees these days! 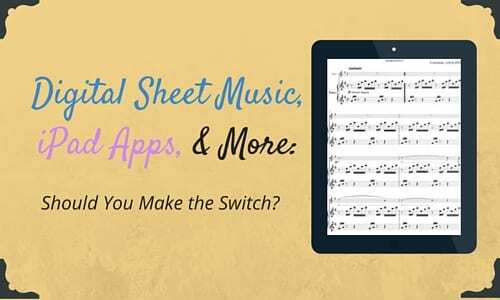 Change requires a learning curve, and switching to digital sheet music is no exception. Since I bought my tablet expressly as a music reader, I had to learn how to use it while I acquainted myself with the sheet music app I use. There’s still a lot I don’t know about it, and I had to look up instructions for a few of the trickier functions. However, overall there were no major hurdles… except one. For some reason, trying to import documents from Google Drive to the app causes my tablet to crash. It’s bizarre, but luckily there are many other ways I can import music into the program. Also, when using a tablet to read music, you need to keep that tablet charged. I got pretty freaked out when I realized that one of my co-workers had 17% battery during a performance the other day. If you are good about keeping your smartphone charged, I’m sure you won’t have a problem remembering to charge your tablet. One of the concerns I had about using digital vocal sheet music was maintaining the ability to write on the music. When I use old-fashioned paper, I spend rehearsals scribbling notes all over the pages. The process of writing on digital music is a little more complex. Writing freehand with a finger or stylus takes incredible dexterity (which I do not possess). However, highlighting is easy, and typing instructions onto the music looks cleaner than handwriting ever could. I sometimes have to perform works that are not memorized. In these cases, singers are usually expected to use a uniform black folder. I usually just put my tablet into one of these folders, which, while annoying, is not insufferable. I’m still on the lookout for a tablet case that has a completely black, finished inside flap – I think that would look enough like a black folder to be acceptable. If you see one, let me know! Do the pros outweigh the cons for you? Great! Here’s what you’ll need to make the jump to digital music. First and foremost, you’ll need a tablet. If you already have one lying around, you’re in luck. If not, don’t feel obligated to buy a $400 model; just make sure the screen is large enough for you to read music comfortably. I got my RCA Viking Pro, which has a 10.1-inch screen, on sale for $80. Then, you’ll need a sheet music app to organize, edit, and view your music. You can create setlists, highlight, add notes, and much more. FAQ: What are the best sheet music apps for iPads and Android tablets? If you have an iPad, I recommend forScore ($9.99). Got an Android like me? Get MobileSheets Pro ($12.99). A smartphone scanner comes in handy when you have a hard copy that you need to import into your digital music library. FAQ: How do I put sheet music on my iPad? All you have to do is take pictures of your sheet music with your scanner app; the app adjusts the white balance to make it look like a photocopy. I use TinyScanner, which is free for both iOS and Android. If you need new music, you can avoid hard copies entirely by downloading digital versions. Here are the top three websites I use to get my digital copies, but this is by no means a comprehensive list. IMSLP: This website has tons of public domain (classical) available for download, all for free. SheetMusicPlus: SheetMusicPlus sells digital copies of music ranging from pop to classical. MusicNotes: This site is similar to SheetMusicPlus, with lots of genres available for digital download. You can also download digital copies directly from music publishers such as Hal Leonard, Alfred Music, and J.W. Pepper. Even if your house isn’t full of crumpled sheet music, you may still benefit from switching to digital music. It’s cleaner, easier, lighter, and better for the environment. Plus, your voice teacher will love that you are so organized (and that you never forget to bring your music to lessons)! If you already have a tablet, I encourage you to download a digital music reader and give it a shot. We live in a digital world, and you may find that digital music is perfect for you. View all Takelessons.com Free Sheet Music Resources. Elaina R. teaches opera voice and singing in Ypsilanti, MI, as well as through online lessons. She received her Master of Music from the University of Michigan, and she has a B.M. from the University of Southern California. Learn more about Elaina here! https://takelessons.com/blog/wp-content/uploads/2016/04/Digital-Sheet-Music-iPad-Apps-and-More-2.jpg 300 500 Suzy S. https://tl-cdn.s3.amazonaws.com/images/logoTagline.svg Suzy S.2016-04-14 08:31:412018-05-23 08:06:16Digital Sheet Music & iPad Apps: Should You Make the Switch? April 12, 2016 /1 Comment/in Singing, TakeLessons Teachers /by Suzy S.
Spring has sprung! And one of the things many of us attend in late Spring is a graduation ceremony or two (or more, if you’re super social!). Consider your audience. Is it at a more formal institution? You want to select something more traditional, or even classic pop. Are you performing at a friend’s party after the big ceremony? Well, maybe current pop may do the trick! Consider the message. Whether it’s formal or informal, you’ll want a song that inspires both grads and family! Some of the themes that work include lasting friendships, new beginnings, hope, and confidence. Not only do you want to choose the right song, but you want to be sure you’re super prepared for your big performance. Your voice teacher can help you make sure that the song is suitable for your level and voice type, as well as help you polish it. No voice teacher? No problem! TakeLessons can help connect you for in-person or online voice lessons. Readers: Know any other good graduation songs to sing? Leave a comment with your suggestion! March 21, 2016 /4 Comments/in Singing, TakeLessons Teachers /by Suzy S.
As a classical singer, you have a variety of things you might be auditioning for, from young artist programs (also known as YAPs) and vocal contests to gigs at restaurants or on cruise ships! 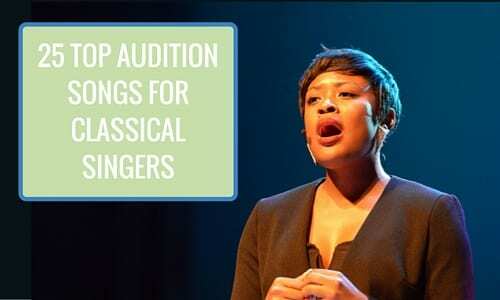 There are a few things to consider for each situation, so here is a helpful list of tips, as well as the top classical audition songs for sopranos, tenors, mezzos, and baritones! It’s essential that every fach (operatic voice type) has a solid aria in English. Almost every program will ask for one, so below are some good repertoire options to consider. This is a beautiful aria to show off a young lyric soprano! This song is short, has a gorgeous line, and is age appropriate. This is exactly the sort of thing a singer needs for a Young Artist Program. This is another aria that is age appropriate. And for lyric tenors, this will show you off like nothing else, both vocally and dramatically. This song has a soaring vocal line to show off your strong middle voice! At just under three minutes, this is another perfect choice for an audition song. For these types of auditions, you should consider the “party hits” of classical music! This can include some Italian folk songs that can be sung by any voice type. You’ll want to choose melodies that people that aren’t opera buffs know and love. Everyone knows this one! It’s happy, super familiar, and shows off your killer high notes! Another winner for a soprano is “O mio babbino caro” from another Puccini opera, “Gianni Schicchi”. All sopranos can sing this one. Just be careful not to drag the tempo; it’s actually meant to be a humorous aria! You can’t go wrong with “Carmen”, and this one in particular is flirtatious and fun. Yes, it’s the tenor anthem. But needless to say, you must have serious technique and power to make this one work. If you can nail this one, the job is likely yours! If you want something a little more lighthearted but still a big hit, there is always Verdi’s “La donna e mobile” from “Rigoletto”. Everyone knows and adores this one! This is a great choice for a classical audition song if you want to draw in a non-opera crowd. Most people will recognize this one, and you can show off your amazing vocal agility and comedic chops. Another hit from “Carmen” is the beloved “Toreador Song”. How can a baritone not have fun with this classic? This cheerful folk tune is yet another song people know and love. It can be sung in various keys if you’re a mezzo or baritone. Another great Italian folk song is “Funiculi Funicula”. Tenors especially will love this one because of the ringing high notes, but don’t let that hold you back if you’re another voice type! If you’re selecting classical audition songs for a vocal competition, I recommend repertoire in different languages besides the standard Italian, French, German, and English. This will be sure to impress the panel! What a gorgeous aria! It’s magical when sung with a beautifully spun line. This is a great choice to show off your charm, your low vocal range, and your Russian! This is an absolutely breathtaking aria, with tons of drama and high notes galore. How can you go wrong? This song is a bit longer, but what a gem! It’s hardly overdone, which makes it an excellent choice. For an opera company audition, consider a piece that will prove you can act, too! Longer arias are definitely okay here. Wow, talk about an acting feast! This is high drama at its best, and is sure to impress! If you can sing this beautifully and tug at our heartstrings, you’ve probably got the role! Full of passion, this is more than just about high notes. Verdi was the king of Italian drama. This song, the tortured title character’s aria, is no exception. Make sure you have a Mozart aria! He’s the bread and butter of operatic repertoire, after all, and chances are your program will be doing one of his operas while you are there. This can be sung by both light- or heavy-voiced sopranos. This character, The Countess, has two fabulous arias, but “Dove Sono” has a bit more motion to it, and is awfully fun to sing. This one sits a bit high and is best for lyric mezzos, but it’s a great one! Mozart wrote some challenging arias for tenor! Mozart tenors need a light, lyric sound, and this aria is perfect for that kind of voice. Not only will this one show off your excellent musicality, it’s also so funny! There you have it — 25 excellent classical audition songs that will show you off, whether they’re tried and true hits or lesser-known gems. Another great resource for repertoire recommendations is your voice teacher, of course! Don’t have one? No problem! There are so many wonderful voice teachers on Takelessons available to help, many with classical backgrounds. As you prepare for your vocal audition, working with a voice teacher will put you at a huge advantage. Happy singing, and good luck at your audition! For even more ideas, see these audition songs for tenors, audition songs for altos, audition songs for sopranos, or songs for contraltos. The best audition songs for sopranos help singers stand out from the crowd and be heard when auditioning. The perfect song should be reasonably challenging, in order to show off your abilities, and should also exemplify personality. This could mean singing something to which you feel you can relate. Ideally, you should be able to create a tone similar to the original but, above all, you must enjoy the song. If you have a powerful voice, it’s important to demonstrate your abilities in the full to the director. “When You Got It, Flaunt It” from The Producers is the perfect piece to do that. It may not be suitable for a serious singing role, but if you are looking for a comedic part, this song is ideal. The song involves some high E flats at the end, as well as a Swedish accent! “Gimme Gimme” from Thoroughly Modern Millie is a great choice to show off your skills through transitioning from a slow, gentle beginning to an energetic end. The most challenging part of the song is probably the final belted out C, as it is held for a very long time. Simple yet sure to impress if it is sung well, “A Wonderful Guy” from South Pacific is a perfect song to choose if you need to show off some acting skills while you are singing. With a very small range, it is not a difficult piece to sing, but can produce great results when executed correctly. Consider “A Wonderful Guy” if you are auditioning for a lighthearted role. “Till There Was You” is a beautiful classic that allows you to demonstrate your wide vocal range, while showing how you are able to incorporate acting skills into singing. This is an ideal choice for sopranos to show how they can interpret and incorporate lyrics into their performance. Sopranos who have a classic Broadway tone would do well to consider “Fine, Fine Line” from Avenue Q. While soft and thoughtful, this song will show off your ability to hit powerful notes, and it includes a number of held high notes. 6. “Where Is Love?” – Oliver! “Where Is Love?” is a favorite among children auditioning for soprano roles and is frequently chosen when the audition does not specify a particular piece. This is a great option for boys with a powerful range. Another song geared toward younger singers is “The Boy Next Door”. Songs like this one are ideal in order to demonstrate range, vocal abilities and ability to express emotion in lyrics. If you’re new to singing, or if you’re just trying to fine-tune your vocal skills, one fun and helpful exercise is to sing duet songs with your vocal instructor or a friend. Pick a style you both like and you’ll find that the possibilities for both fun and music making are endless! Why Are They Helpful to Sing? When you sing with piano, or with a chorus or band, there’s often someone else playing the same line you’re singing. While this is great for learning to sing in tune and working on the tone of your voice, you’re not really stretching your listening skills. When you sing a duet there are just two lines; your part is all your responsibility and the only thing you have to find your notes from is the other person’s line. What Are Some of the Best Duet Songs? If you’re new to singing vocal duets, starting with some that you like and know well is the best way to learn. This way you’ll already have the tune in your ear and you probably have lots of recordings to listen to. Here is a list of some of the best duet songs from many different genres. There are also fun games you can play with your duet partner that can improve your ear and singing abilities. One great idea is based in the jazz tradition; simply improvise! Pick one person to sing a solo and have the other harmonize. You’ll find yourself quickly learning what sounds good and what doesn’t work as well. If this seems too daunting, just pick a song from the best vocal duets listed above, make up your own verses, then play with the harmonies, and then play around with the melodies. This is a great way to train your ear and your voice. Duets are a great way to have fun and improve your singing skills. Start with what you know and then branch out from there; you’re sure to have a great time and even learn a thing or two! February 10, 2016 /0 Comments/in Singing, TakeLessons Teachers /by Suzy S.
Broadway belting is something audiences have loved to hear since the 1940s, when the Queen-of-All-Belters, Ethel Merman, was a main attraction. Belting is a style of singing in which we bring the chest voice higher than we normally would, to convey extra power or emotion. While some people (and teachers) shy away from it, it’s an exciting style of singing that, when done correctly, can be very impressive! Many musicals have killer belting songs. So if you’re looking for some great picks for singing auditions, I’ve pulled together the list below, representing a wide variety of time periods, styles, and personalities! Made popular by the great Judy Garland, this number will have you belting several big B flats… with gusto! This 1937 show tune is a solid classic to choose if you’re auditioning for an older show. It’s also a great choice for teen belters with a good middle voice; it provides enough of a challenge without too much of a chance to strain the voice, as it doesn’t sit too high. Consider this a nice intro to belting! What a showstopper! Although Jerry Herman’s “Mack and Mabel” was not a hit, critics agree the music is sublime, and this is no exception! This sassy number requires you to sing some high notes, so it’s best for an advanced adult belter with more secure technique. Kander and Ebb wrote “The Act” for another legendary belter: Ms. Liza Minnelli! But don’t worry: you can make this one your own — and you should. This song sits lower, so range-wise it’s not difficult. But it runs for six minutes, so if you’re singing it for an audition, make sure you perform the cut that shows you off best! It’s also ideal for a dancer who belts. After all, these ARE the composers of “Chicago”! Not only will you be showing off your belting chops, but you’re expected to bring it as far as showmanship, too! Ooh, this is a GREAT new one — yes, from another flop musical. What makes this Broadway song so great? It’s completely sassy and has a memorable “cakewalk” style. You get to belt this one full out; it’s probably the most challenging number on this list, as you need to belt pretty high… again and again. So this one is for the advanced belters only! It’s been said “People” should be off-limits, as it belongs to Barbra (and I’ll have to agree with that! ), but as far as I’m concerned, singers should feel free to use the REST of the great songs in “Funny Girl”! The big belting doesn’t really come until the end of this song, so I’d say this is more for the intermediate belter. The bulk of the song lies in mid-voice and is meant to be sung with TONS of conviction… and serious comedic chops! This is for younger belters! It’s a wonderful, uplifting tune that is sure to wow. It’s also very good for those who have more of a soprano-ish quality to their voice. (Soprano/belt is definitely a voice type! Lucky ladies like the fabulous Sierra Boggess in the video below are proof they exist.) The melody is gorgeous and quick-moving, and it’s just under three minutes. Before you choose one of these songs, remember that belting is a specific vocal skill that doesn’t come easily to most of us. It’s super easy to hurt yourself if you do it incorrectly. The last thing you want is to strain your voice! Some voice teachers specialize in the technique, so make sure you’re working with someone who can help you achieve the sound you’re after! TakeLessons has many talented instructors who can help you achieve your belting goals. Good luck at your audition!